The Celtic assistant boss says they have the strength to cope with a long absentee list. Chris Davies has admitted that Celtic are "stretched" by their growing injury list but believes the club have the resources to cope when they face Hibs on Wednesday. Celtic's 2-0 win at St Johnstone on Sunday came at a cost with James Forrest set to have a scan on a hamstring injury and expected to be out for "a period of time", while Mikael Lustig and Odsonne Edouard are doubtful with Achilles and foot injuries. It adds to a list of absentees for Brendan Rodgers to deal with. Eboue Kouassi and Daniel Arzani are long-term absentees with knee injuries, while Leigh Griffiths has no known return date as he deals with personal issues. Tony Ralston, Kieran Tierney, Tom Rogic and Filip Benkovic are still sidelined, while Vakoun Issouf Bayo is building fitness after arriving in January. 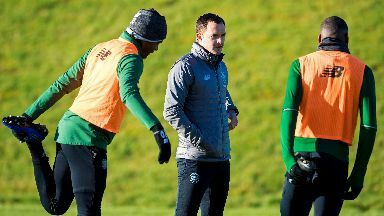 Kristoffer Ajer is suspended for Wednesday and, though Olivier Ntcham and Dedryck Boyata are back in training, Davies says the squad is down to the bare bones. "We have a pretty good team of injuries and suspensions, but we have a few coming back and close to coming back," Davies said. "But we have got a depth of squad. "We have shown that we can (cope) in the St Johnstone game itself and we can put a team out that is going to be a very good team of quality and we will be able to cope, no problem. "Nir Bitton can play centre-half, we've got Jack Hendry, and Dedryck was training today so we have to look at our options, what system we want to play and make a decision." Hibs will arrive in Glasgow still under the stewardship of caretaker boss Eddie May as they continue to look for a successor to Neil Lennon. Davies doesn't believe the current uncertainty will make any difference to the opposition. "Difficult game. They have always been difficult opponent for us, home and away," Davies added. "Speed, intensity, they have some good players. "So for me that is a difficult game but we have to as always focus on ourselves, our game and (if we) bring our intensity and quality to the game we should get the win. "But I certainly wouldn't underestimate them at all and that's not something we would do."